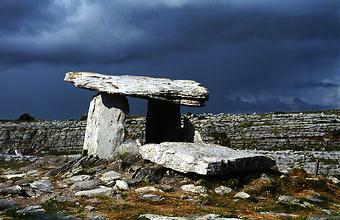 This dramatic site, on the karstic limestone pavement of the Burren, is one of the most famous Irish dolmens. The name Poulnabrone literally means 'The hole of the sorrows'. The thin capstone sits on two 1.8m (6ft) high portal stones to create a chamber in a 9m (30ft) low cairn. The eastern portal stone was replaced in 1985, following a discovery that it was unfortunately cracked; excavations during the repair showed that this site dated back to about 2500 BC. Uncremated remains were found in the chamber, its portico, and in the grykes (crevices in the limestone floor). In particular, there were the main body bones of one newborn baby, six juveniles, and 16-22 adults. Only one of the adults lived beyond 40 years, and the majority were under 30 when they died. An analysis of all the fragments of disarticulated bones revealed a hard physical life and a coarse diet; it was further proved that the bones were naturally defleshed elsewhere (by exposure or burial) and only then moved within the chamber at Poulnabrone. A number of grave goods were found in the tomb : a polished stone axe, two stone disc beads, a perforated bone pendant, part of a bone pin, two quartz crystals, flint and chert arrowheads and scrapers, and over 60 sherds of coarse pottery. This probably involved a ritual and reveal an exact planning, but the purpose remains unknown. The dolmen is surrounded by a low mound, largely made up of stones, but it seems unlikely ever to have covered the whole monument. It is worth noting that in the same area there are about seventy other tombs, like the one at Gleninsheen.